Tag sequencing is a feature in Google Tag Manager that is sometimes overlooked, but yields great benefits when utilized in the right situation. Due the asynchronous nature of Google Tag Manager, typically you have little control over the order in which your tags fire; tags with the same triggering event all fire at the same time and can complete in any order. Tag sequencing gives you much more control and allows you to fire up to 3 tags in a sequential order. It’s an often overlooked feature that utilizes a setup tag, a main tag, and/or a cleanup tag. 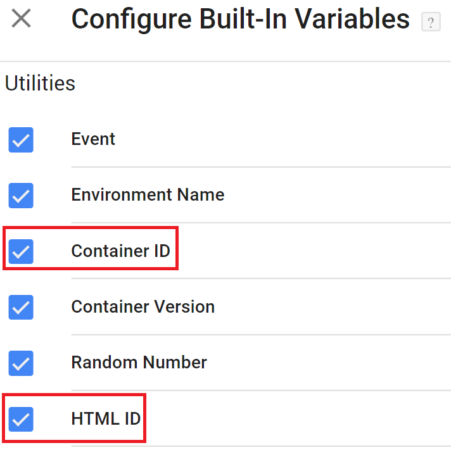 The purpose for this feature is to set up your own firing sequence separate from the normal flow of your GTM container to do things such as, dynamically pull data from a page to be used in tag in the same event. Please be aware that tag sequencing and tag firing priority are two different features that do two different things! Tag firing priority only assigns firing priority to a given tag: giving preference to specific tags to fire sooner, but not concerned with making sure tags complete in any particular order. 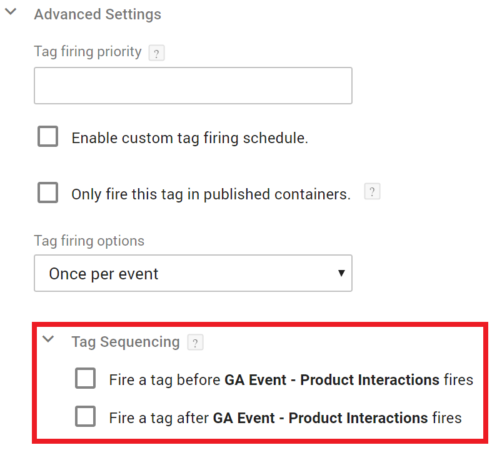 With tag sequencing, you are assigning an actual order for when a group of tags should fire: tag A fires, then tag B, and then tag C.
Because Google Tag Manager loads asynchronously, there’s no real guarantee that a specific tag will load directly before or after another tag. Tag sequencing gives you the power to set a tag sequence to have up to 3 tags fire one after the other in exact order. Before we dive into the interface and create our own tag sequence, let’s get a little more technical. Think about getting a receipt after making a purchase at a grocery store. Before we print out a receipt, there are several tasks that must occur first. After each step, a message is sent saying whether or not that task was completed successfully. Did we scan all the items on the belt? SUCCESS. Did they swipe their card? SUCCESS. Did they enter a correct pin? SUCCESS. Was the transaction approved? SUCCESS. Now we print the receipt. We can now apply this to how a tags in GTM work! Our container loads on our page, and GTM listens for specific actions from the user to trigger our tags (functions). When a tag (function) is triggered, it executes, and upon completion, lets GTM know whether it succeeded or failed by calling a onSuccess or onFailure callback. With tag sequencing, we just chain these specific events together. Say you have a setup tag and a cleanup tag. The main tag will not begin to execute until the onSuccess callback of the setup tag is called. Similarly, the cleanup tag will not begin to execute until the onSuccess callback of the main tag is called. If a tag fails to execute, its onFailure callback will be called, and if you have chosen to not allow one of the tags in your sequence to fire in the case a tag fails to execute, your sequence will be aborted. Again, you don’t really have to worry about using callbacks since they work behind-the-scenes, but if you plan to use Custom HTML tags in your sequence, it’s worth knowing a bit about them! If you care to learn more about callbacks – especially the hitCallBack that Universal Analytics tags make use of, check out Dan Settlemire’s blog post on the topic! To create a configure a tag sequence, you need to expand the Advanced Settings tab in the main tag. Within that tab, you will expand the Tag Sequencing tab. At this point, you have three options: you can choose to fire a tag before your event tag (the setup), after it (the cleanup), or both! If you choose to use a setup tag, this will ensure that a tag definitely fires before your main tag. Same deal with the cleanup tag, only now you’re waiting until after the main tag fire. Typically, you’ll set these sequences up because on tag relies on the output of another tag. So GTM has thought of this, and they also let you choose what to do when one of the tags in your sequence fail. You might choose to stop everything, or you may have a situation where you need the main tag or cleanup to fire regardless if your setup or main tag fails. Lastly, a note on triggers. You may already have triggers and trigger exceptions attached to your setup and cleanup tags. That’s okay! However, when you use a tag as a setup or cleanup, the setup tag and cleanup tag triggers are ignored. These setup and cleanup tags are specific to your sequence, so you shouldn’t worry about making triggers for them – the main tag’s triggers will control when these fire. You’re probably super excited to try out this radical feature in GTM, and asking yourself, “what can I use this awesome feature for? !” The most common use case for tag sequencing is when you want to pull data off a page dynamically to use before another tag fires. You might use your setup tag to grab the values off the page when an event occurs, and use the main tag to populate custom dimensions with the values. We also see tag sequencing often with social tagging or third-party vendors who request a specific tag fire first, before sending in a more specific event or action. By separating the standardized page-level portion from the specific event tag, you’re able to avoid discrepancies between tags and centralize the management of that particular function. Check out Dan Wilkerson’s blog post series to learn more about using Custom HTML tags in tag sequences, and to push/set data to the data layer. Be careful with your setup/cleanup tags, especially if they’re attached to multiple tags and may end up firing more than once on a page. There’s another helpful feature called ‘Tag Firing Options’ that will allow you to specify on tags if they should fire Once Per Page, Once Per Event, or Unlimited. Once per page will help alleviate these concerns, and help make sure that you don’t double-track by firing the same tag multiple times. Tag sequencing is a great way to set up a sequential order of tags when you need tags to fire a specific order. You can make use of a setup tag to pull values off a page dynamically, and use the main tag to utilize those values. You can even use a cleanup tag to utilize event data from your main tag. Tag sequencing makes use of callbacks to communicate with one another to let the next tag in the sequence know if it can begin to execute. Custom HTML tags need a bit of encouragement to get them communicating with tags in a sequence, and don’t worry about triggers for the setup and cleanup tags; they only listen to whether the main tag’s trigger fired. For more about tag sequencing, check out Simo Ahava’s blog post on the topic! If you have ever used tag sequencing in a unique and interesting way, tell us about it in the comments!